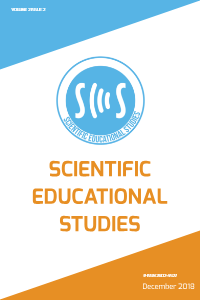 Scientific Educational Studies is a scientific and peer-reviewed journal that makes a contribution to the field of Educational Sciences and Teacher Training and being published biannually (in April and October). Aim: Our journal SES aims to contribute to the theory and practice of Educational Sciences and Teacher Training. Vision: Our vision is to take a leading role in international scientific publications within the framework of Educational Sciences and Teacher Training and to be indexed in respectable indexes. Mission: Our mission is to present high quality original articles with reference to objective refereeing processes in order to be listed in respectable indexes in the field of Educational Sciences and Teacher Training. Goal: Our goal is to create a sustainable publishing policy with at least two issues per year. The topics presented by Scientific Educational Studies are listed as follows.